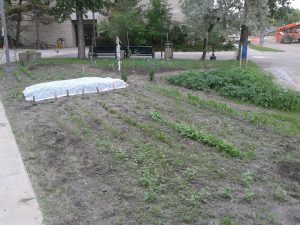 In spring 2017, The Faculty of Education’s Indigenous Family Therapies Class (EPSY 870AB) in partnership with the Indigenous Peoples’ Health Research Centre (IPHRC) have planted a Project of Heart Reconciliation Garden. 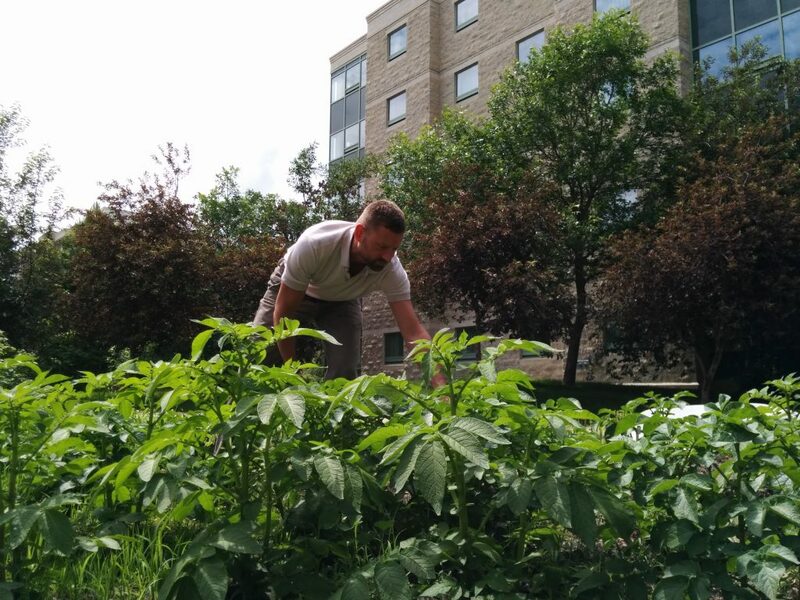 • To identify gardening as a social justice approach. 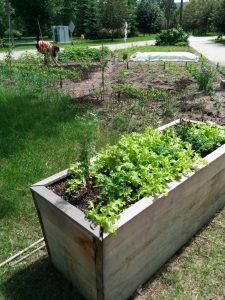 Celebrated in May and June, Honouring Memories, Planting Dreams invites individuals and organizations to join in reconciliation by planting heart gardens in their communities. 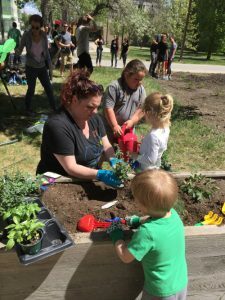 Heart gardens honour residential school survivors and their families, as well as the legacy of the Truth and Reconciliation Commission of Canada. 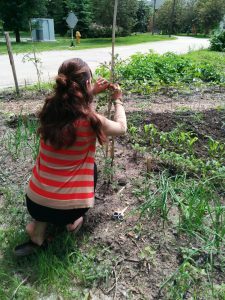 Each heart represents the memory of a child lost to the residential school system, and the act of planting represents that individual’s commitment to finding their place in reconciliation. 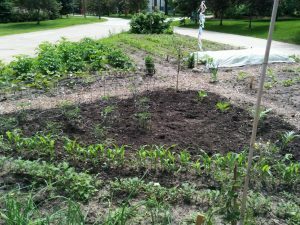 In 2016, more than 6500 hearts were planted in gardens across Canada. 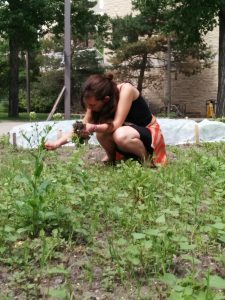 Early in her artist residency at the University of Regina, Daya Madhur was invited to support the preservice education students on their professional development field trip to Fort Qu’Appelle where the history and beauty of the valley inspired her creative journey. When I was a young child, I remember walking (nonchalantly) into the bathroom of our old house where my father was taking a bath. Everything initially seemed normal, except I noticed a scar that didn’t look normal. I asked him what it was from. He told me, in a gentle enough way to reflect my age, that he got it while he was at school. He told me that schools back then were not very kind, and that he had been hurt there. We agreed that this wasn’t nice, and I remember feeling happy that my teachers at daycare didn’t give me scars. After an education in political studies and developing a strong interest in indigenous issues in Canada, I know much more than I did as a child. I am cognizant of the fact that within the residential school system there was widespread abuse, several spectrum’s worth at times. I am lucky that I did not have to live through that and I feel empathy for those people who did and who are still struggling with the resultant effects. We as a nation are still coming to terms with our history. Nicholas Flood Davin founded the Regina Leader newspaper that detailed reports of Louis Riel’s’ trial. He was also a Member of Parliament, a war correspondent in England and lawyer. He also authored in 1879 what has come to be known as the Davin Report; a “Report on Industrial Schools for Indians and Half Breeds,” stating that, among other things, “little can be done” with adult Indians. This followed on the heels of the adoption of the 1857 Gradual Civilization Act and the 1876 Indian Act by what was eventually Canada. To be fair, Davin lived a varied life, and had a great effect on the West and invariably the country, for good and bad reasons. However, one of his most influential actions was that he wrote a report on the effectiveness of industrial schools and the ineffectiveness of day schools for the federal government. The concern raised by Tom Richards (April 18 column) is that this may be a case of “presentism” in play. Having views accepted by one’s contemporaries does not mean those views are either righteous or justifiable. We should not continue to celebrate a co-author of the pain and suffering implemented through the residential school system. We now realize the extent of the damage that has been done and the long-term effects that plague too many indigenous people. We have had the time and the opportunity to study it, at the expense of affected indigenous lives. The fact that racism was a prevalent view in the 1800s does not excuse Davin’s actions that furthered the mechanisms of pain and hardship for indigenous peoples. He may have laid the groundwork for part of the West to expand, but if we take the indigenous perspective into account, he also laid the intellectual groundwork for Canada to dispossess indigenous lands from indigenous groups. To attempt to kill the Indian within the child. To disappear us. This is not to say that we should scour historical figures from our textbooks when our morality strays from theirs. Accomplishments should be appropriately credited, atrocities should not. We are starting to have this difficult discussion around the historical figures that raised Canada on indigenous land. John A. MacDonald is no less contentious a figure, and of course we would not want to erase him from our history, but I don’t want to defend the actions of old dead men simply to preserve their name. We know more as time passes, we change our understandings to reflect that. There is no concern of improperly understanding the past here — we know that the time since gone was generally racist. If we take the indigenous perspective into account, evaluating the past through a modern prism is not something that should be feared; it’s the way indigenous peoples pass down information and have done for thousands of years. We educate our children through stories. We use them to convey our histories and our discoveries and understandings of the world as we see it. We adapt our perspectives in times of change and reinterpret our worldview to reflect the changing world. The actions and follies of our past guide us as indigenous peoples in making our choices and plans for the future. The reinterpretation of these understandings is what keep traditional knowledge from stagnating. They keep societies alive and allow them to thrive in the face of adversity. On Davin’s other ventures there is room for discussion as to his contributions to Canada, but on the subject of residential schools we cannot justify his actions in the name of preserving history, to say nothing about preserving the name of a school. Davin’s report is a contributing factor to the government policies that caused the hardship that we as indigenous peoples have at preserving our histories. We have had the Truth and Reconciliation Commission release both its calls to action and its final report in the last year. We have seen forward movement from the University of Saskatchewan in working towards supporting the aims and goals of the TRC. If we deny the opportunity for a small, but meaningful, change in the name of a public building, we are not even paying lip service to the principles that have been guiding us through what has proven to be a difficult conversation. 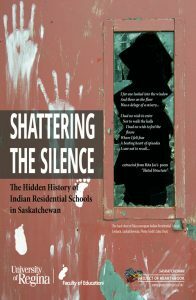 Renaming Davin school in Regina would not take away the past decades of its name the same way that the actions we take today will not rewrite the violent and colonial history that bestowed the residential school system upon us as indigenous peoples, to say nothing of the contributions provided by the Davin report. They would simply reflect the changing societal values within the nation they helped build. When we name things, what do we name them for? If we named this school today, knowing what we do, would we still choose the name Davin? As Richards so correctly quoted Mary Beard, a British public intellectual, “it is our job to get off our backsides and do better.” Renaming the school to something that recognizes the nation-to-nation relationship between Canada and its indigenous peoples will still allow for the discussion of the residential school legacy in Canada, and its beginnings, without damaging our historical perspective. Rather, it will take us closer towards truth, and in turn reconciliation. We as a nation no longer want to kill the Indian in the child; we want to include them. To repair what has been damaged. Leon Thompson is an intergenerational residential school survivor, incoming president of the Aboriginal Law Students Association, and nehiyaw (Cree) law student at the University of Saskatchewan. CTV-Regina Indigenous Circle May 5, 2016 from Dr. Marc Spooner on Vimeo. Dr. Marc Spooner and Dr. Shauneen Pete (on CTV news), professors in the U of R Faculty of Education, discuss the importance of communities looking at who has been memorialized and who has significantly not been, and who has been served and who has not, as we strive towards reconciliation, righting past and present wrongs done to the First peoples of Canada. The Davin School name (in Regina) is one such example: Nicolas Flood Davin wrote the Davin Report, which was instrumental in establishing the Canadian Residential School system, designed to separate children from their families in order to strip them of language and culture by diminishing parents’ abilities to transmit these vital aspects of their identity to their children. 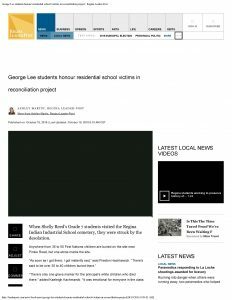 Davin School memorializes Davin, who was also the founder of the Leader Newspaper and a prominent political figure, but the Regina Indian Industrial School cemetery–where children who died while attending the residential school are buried–is not commemorated (yet). 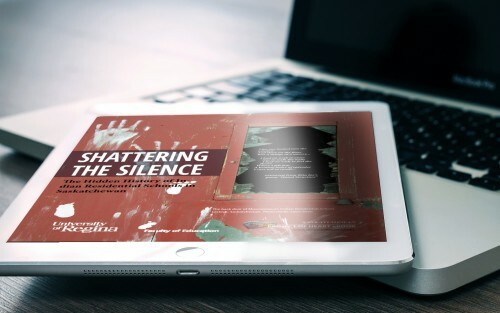 Through the Truth and Reconciliation Commission’s work, it is now understood that the high number of student deaths that occurred while attending Residential Schools were largely due to negligence on the part of the Canadian government and church administration. Such cases as the Davin School and the RIIS cemetery reveal the priorities and values held by a society suffering from amnesia about the people who welcomed Europeans to this land, and the Canadian government policies that attempted to strip them of their cultures and languages, that separated families for seven generations, and whose policies made First people’s children vulnerable to physical, emotional, sexual and spiritual abuse, and to the intergenerational effects of IRS abuse and loss. It is time to revisit the past, discover the truth, and right the wrongs in order to move forward together, in reconciliation.